Welcome back. Here’s one for you to mull over. Why, when we’ve made extraordinary progress on a wide range of world problems--health, violence, poverty, education, prejudice--do people think things are getting worse? Collaborating researchers from Harvard, Virginia, Dartmouth and New York universities recently published at least one good answer: prevalence-induced concept change. In short, they demonstrated that people often respond to reductions in the prevalence of a stimulus by expanding their concept of it. More to the point, as problems are reduced, we count more things as problems. The researchers conducted seven tests. Test 1. Very purple to very blue dots were displayed on a computer screen, one dot at a time. Test participants were told there would be 1000 dots, shown in blocks of 20, and that some blocks “may have a lot of blue dots, and others may have only a few.” They had to decide if each dot was or was not blue. After 200 dots, the prevalence of blue dots was reduced for half the participants. 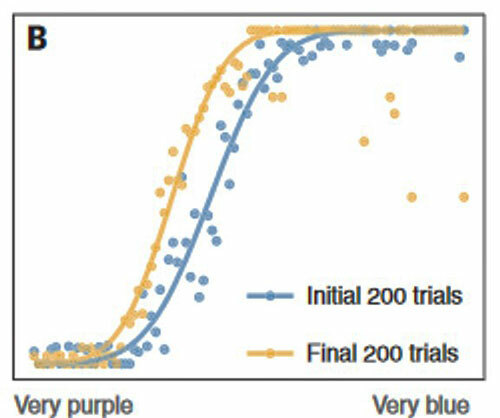 Result: Those that viewed the lower prevalence of blue dots on the final 200 dots were more likely to identify dots as blue. With the reduced prevalence, the participants’ concept of blue expanded to include dots it had previously excluded. Test 1 results for reduced prevalence of blue dots condition. X-axis is dots’ objective color; y-axis is % of trials on which participants identified dot as blue (from science.sciencemag.org/content/360/6396/1465). Tests 2 and 3. Test 1 was replicated, changing the instructions to participants in the reduced prevalence condition. For Test 2, they were told the prevalence of blue dots would definitely decrease. For Test 3, one third were instructed to be consistent and not allow their concept of blue to change, and one third were given that same instruction along with a monetary incentive for following it. The results were the same as in Test 1. Test 4. Test 1 was replicated, except the prevalence of blue dots was reduced gradually for some participants and abruptly for others. The result was the same as in Test 1. Test 5. Test 1 was replicated, but the prevalence of blue dots was increased instead of decreased. The change reversed the effect seen in Test 1. Participants were less likely to identify a dot as blue when it appeared on the final dots. Tests 6 and 7. Having shown the prevalence-induced concept change observed in Test 1 would hold despite a forewarning (Test 2), instructions and incentives (Test 3), sudden decreases in prevalence (Test 4) and prevalence increases (Test 5), the researchers tried more complex concepts. In Test 6, dots were replaced by 800 computer-generated human faces, ranging from very threatening to not very threatening. After the prevalence of threatening faces was reduced for half the participants, they were more likely to identify a face as a threat on the final series of faces. Their concept of threat expanded to include faces it had previously excluded. In Test 7, participants reviewed 240 research proposals that varied from very ethical to very unethical. After the prevalence of unethical proposals was decreased, participants’ concept of unethical expanded to include proposals it had excluded. To be clear, there are times when prevalence-induced concept change is appropriate (e.g., selecting blemished fruit when the perfect fruit is less prevalent), and times when it is not (e.g., what a radiologist identifies as a tumor when tumors are less prevalent). The study demonstrated instances when it should not have occurred. The results have significant implications. We may fail to recognize the success of problem-solving efforts simply because we view each new instance in the reduced prevalence context that problem solving has produced. As the prevalence of a problem decreases, we’re inclined to redefine and increase our concepts of the problem, which may be one source of pessimism about the world’s problems. Perhaps that should be mulled over. Thanks for stopping by. So, basically, we see what we expect to see, with the expectation being based on recent experience.